There is something wonderful about the simplicity of good bread. None of the ingredients taste good on their own but mixed, the the magic of yeast and baking that makes it delightful. This is not a new insight but rather something that comes to mind every time a fresh loaf comes out of the oven. I’ve recently got into baking bread. I started with the basic five minute artisan and then did some additional research and experimentation from there. I don’t know how many loaves I’ve made so far, but it’s still such fun. Tonight we bottled wine while nibbling on the fresh bread. Between the beer, wine and bread that we make at home, I’m impressed with what the yeast can do to seemingly boring ingredients. So, here’s a cheer for yeast. 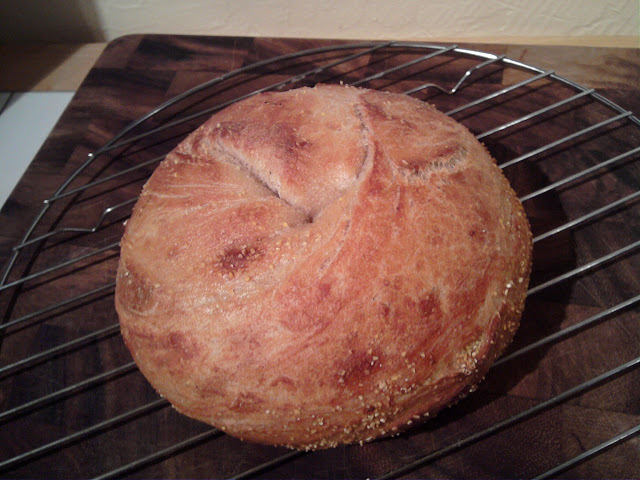 This entry was posted in Cooking and tagged Bread, Yeast. Bookmark the permalink.